Successfully Added NME N75 Box Mod - 75 Watt, 510 Thread, 0.05 To 3.6 Ohm Resistance, Temperature Control to your Shopping Cart. The NME N75 Box Mod is an extremely powerful 75-watt box mod that features a sleek, compact, and durable design. Not only does this box mod look appealing to the eye, it also delivers an outstanding and powerful performance which makes it the perfect box mod for all vapers out there that like to take their vaping experience to the next level. Featuring an effective variable wattage from 1 to 75 Watt, you can be assured that the NME N75 packs enough power to meet your vaping needs and demands. Additionally, this vape mod packs a 510 thread, making it compatible with the majority of atomizers and tanks out there – allowing you to pair it with your vape mod accessories of your liking while building your optimal vaper. 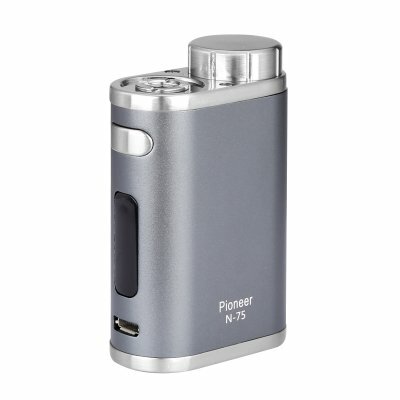 For all the vapers out there that like beast power, the N75 is the perfect choice. Featuring a stylish and simple to use design, this 75W vape mod is perfect for both beginning and advanced vapers alike. Featuring an adjustable ohm resistance from 0.05 to 1.5-ohms in TC mode, and 0.1 to 3.5-ohm in VM mode, this vape mod is guaranteed to provide you with a great taste experience while simultaneously producing exceptionally large vapor clouds. Supporting both a VW mode and TV mode, the NME N75 box mod fully allows you to take the most out of your vaping experience by letting you to fine tune your settings for particular flavors. Besides its adjustable Wattage and Ohm range, the NME N75 box mod furthermore features temperature control that allows you to set the temperature of your liking between 100 and 315 degree Celsius. This powerful 75 Watt box mod furthermore features an 18650 battery (not included) that can be easily recharged via its micro USB port. Packing all this juice you can be assured that you’ll be able to enjoy countless of vaping sessions without needing to worry about running out of power in the middle of a relaxing vape. To make sure that you always have the right settings enabled that support your personal vaping style, the NME N75 box mod features a sophisticated LED display that keeps you constantly up to date about your current settings. With this powerful 75W vape box mod you can be assured that, from now on, you’ll be able to enjoy all your upcoming and relaxing vaping sessions to their absolute most. The NME N75 Box Mod comes with a 12 months warranty, brought to you by the leader in electronic devices as well as wholesale electronic gadgets..
Arabic: - فابير مربع وزارة الدفاع - Chinese Simplified: - 汽、 框 Mod - Czech: - Vaper Box Mod - Dutch: - Vaper vak Mod - French: - Vaper Case Mod - German: - Vaper Box Mod - Hebrew: - Vaper תיבת Mod - Hindi: - Vaper बॉक्स मॉड - Hungarian: - Vaper Box-Mod - Italian: - Vaper casella Mod - Japanese: - 蒸気ボックス Mod - Korean: - Vaper 상자 Mod - Malay: - Mod Peti Vaper - Norwegian Bokmål: - Vaper for Mod - Romanian: - Mod de Box VAPER - Russian: - Vaper Box мод - Spanish: - Vaper caja Mod - Thai: - Mod กล่อง Vaper - Turkish: - Vaper kutusu Mod - Vietnamese: - Vaper Box Mod.